Select six foam pads of the same size in the colors of your choice. You know what pads you need better than anyone. Customize your own perfect pad kit! This specially priced combo includes any six Lake Country CCS 3.5 Inch Foam Pads of your choosing for one price. You can choose all pads of one color or mix it up. Any combination is the same price. CCS Spot Buffs 3.5 inch foam pads that attach to your electric drill- perfect for spot polishing! You�ve babied your vehicle from the day you drove it away from the dealership�monthly waxes, weekly washes. But eventually it will get a scratch. Your perfect vehicle ruined by one little blemish! You try to remove it by hand, but it�s just too deep. You need to use a polisher, but you�re afraid of abrading the paint around the scratch. The pads on your polisher are 6.5� and the scratch is only about 3�. What can you do to spare the rest of your paint? Lake Country�s CCS 3.5 inch Foam Pads are flat full contact buffing pads that work with your circular polisher, dual-action polisher or electric drill to correct problem areas in automotive paint more easily than ever before. 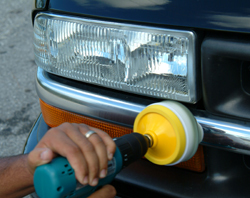 The smaller polishing surface means you�re only attacking the blemish, not the surrounding paint. Scratches and oxidation often occur in particular spots on your vehicle. Rarely is your whole vehicle covered in blemishes. If the majority of your vehicle looks like new, there�s no need to compound the whole thing. In fact you might cause swirls if you use an overly abrasive pad on perfectly good paint. With Spot Buffs, you are only addressing the problem, not creating new ones. CCS foam pads provide ample surface contact to effectively work the paint. The CCS pockets are small so they don't affect the amount of foam continuously touching the paint during operation. All pads feature hook & loop fasteners to secure the pad to the backing plate. The beauty of Spot Buffs is that you don�t even need a polisher to polish out small swirls and scratches. A special drill adapter screws into your drill and your 2 �� backing plate. The plate has hook & loop for quick pad changes, just like standard backing plates. Spot Buffs are recommended for 12 or 18V electric and cordless drills with an output no greater than 3000 rpm. Because those rpm�s are concentrated into such a small surface, too many rpm�s will increase the risk of burning paint. On a low speed, this is extremely unlikely. Likewise, when using Spot Buffs on a circular polisher, do not use them in excess of 1000 rpm. A dual-action polisher has a varied motion so you can afford to set it slightly higher, between 3 and 4. CCS Yellow Cutting Foam 3.5 Inch Pad - Use this pad to apply compounds or polishes to remove severe oxidation, swirls, and scratches. It is the most aggressive and should only be used on oxidized and older finishes. Always follow this pad with an orange or white pad and a fine polish to refine the paint until it is smooth. CCS Orange Light Cutting Foam 3.5 Inch Pad- This is an excellent, high density foam with light cutting power. It works well for applying microfine compounds and smoothing scratches and swirls. You�ll want to try this pad first before using the yellow pad; you always want to use the least abrasive pad necessary for the job. CCS White Heavy Polishing Foam 3.5 Inch Pad - This pad features high absorption foam for the application of waxes, polishes and sealants. This pad has very little cutting power and works well for application purposes. It�s made of soft, porous foam so it�s gentle on your paint. They�re also perfect for polishing metal wheels, bumpers, and mirror covers. CCS Green Polishing/Finishing Foam 3.5 Inch Pad- Use this foam to apply one-step cleaner waxes. It is a balance of polishing and finishing that is perfect for all-in-one product application. CCS Blue Light Polishing 3.5 inch Pad � This pad is not as dense as the green polishing pad and provides little cutting ability. Generally used to polish to perfect, this pad will leave a high shine on the surface. Perfect for use with a finishing glaze, last-step polish, and some all-in-one cleaner polishes. CCS Black Finishing Foam 3.5 Inch Pad - Composition is firm enough to withstand added pressure during final finishing to remove buffer swirls, but it is gentle enough to buff your vehicle to an attractive luster. Use with machine glaze or finishing polish. Spot Buffs are a great value. They work like the bigger pads, but they are made to handle individual blemishes. If you only have a few isolated scratches, there�s no need to buy an expensive polisher and over-sized pads. Spot Buffs attach to your electric drill using the special adapter so you get powerful polishing action at a reasonable price. Plus these pads are concave in the middle to prevent splatter. You don�t waste products! If you already own a circular or dual-action polisher, Spot Buffs allow you to tackle small blemishes without abrading the surrounding paint. If your paint looks good, don�t put it through unnecessary polishing or compounding. Save time and effort by addressing only the problem area with 3.5 Inch Spot Buffs. Related Items - Lake Country 3.5 Inch CCS Pads 6 Pack - Your Choice!